I think we can all agree: a shower just isn’t the same without your favourite music playing. And trying to hear the music from your iPhone over the sound of your shower just doesn’t cut it. Luckily, we’ve got the solution for you: Broan’s Sensonic Speaker Accessory. This has to be our favourite bathroom accessory because it gives you high quality audio without taking up any counter space. Whether you’re a die-hard shower singer, want to listen to your favourite podcast while you get ready in the morning, or enjoy relaxing music to go with your bath at the end of the day, the Broan Sensonic Speaker is for you. The Sensonic is a speaker that uses Bluetooth wireless technology and fits into our QT series bathroom fan, so you get great audio with the added bonus of having the speaker out of site. 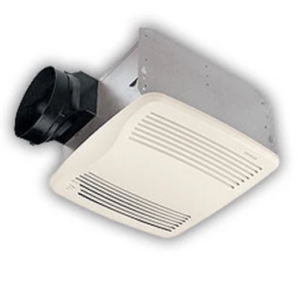 It can be added into your current home if you already have a QT series bath fan or by retrofitting out your old bath fan, and it’s also great to consider when doing renos or building a new home. Home builders love using it because it adds something extra to their work, and their clients really appreciate the added touch. Learn more about the Sensonic Speaker here. 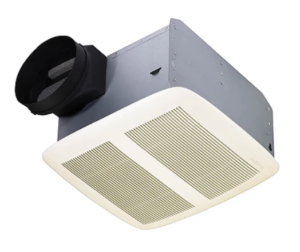 The speaker fits perfectly with any of Broan’s QT series bath and ventilation fans, or for a packaged kit, the SPK110 which includes the fan and speaker. The fans themselves are some of the best on the market and have a number of features that set them apart. People often skip using their bathroom fan simply because they’re too loud and the sound is irritating. A fan’s noise level is rated in Sones, and typical economy fans are rated at 4 Sones, while really quiet fans typically rate at 1 Sone (similar to the level of noise of a refrigerator). In contrast, Broan offers exceptionally quiet fans, with some as low as <0.3! At 1.0 sones, not only does the Sensonic fan eliminate that irritating fan sound, but it also means the music from your Sensonic isn’t competing to be heard over the fan. Mold and mildew are a major problem, which a bathroom fan helps to protect against. Broan offers humidity sensing fans, which turn on and off whenever humidity becomes a problem. This means you’ll never accidentally steam up your bathroom after forgetting to turn on the fan, and you’ll be have additional protection against the buildup of mold or mildew. The most important function and bathroom ventaltion devise serves. The first consideration to make when choosing a fan is the size of your space. 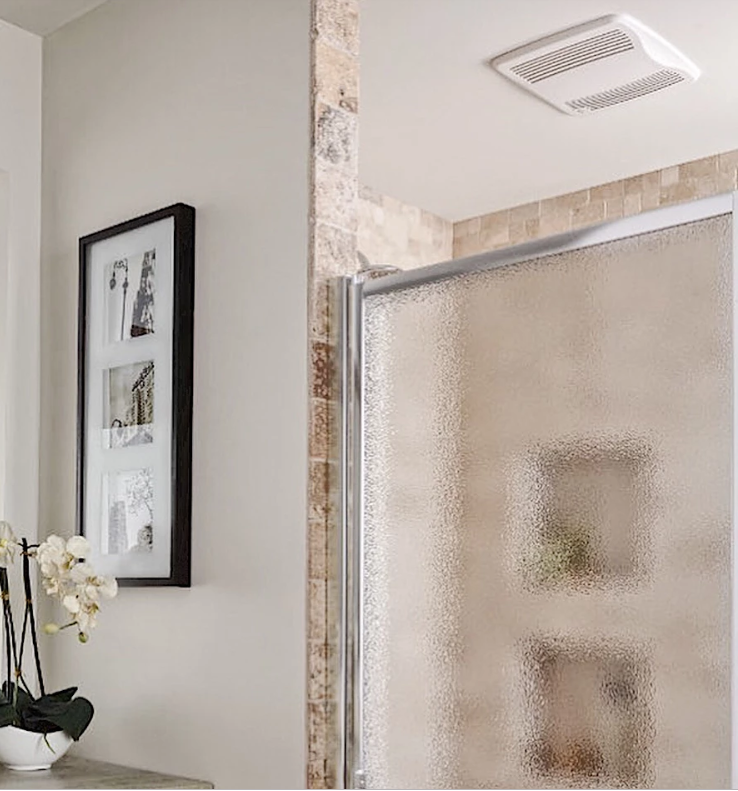 A good general rule for bathrooms with 8’ ceiling heights is to allow at least 1 cubic foot per minute (CFM) of ventilation for every square foot of room size for bathrooms under 100 square feet. For larger rooms, the recommendation is based on adding 50 CFM for each toilet, bathtub or shower and 100 CFM for jetted tubs. Generally speaking, the larger the CFM rating of the fan, the faster it will take care of any issues. From there, you can choose the features that best suit your needs. 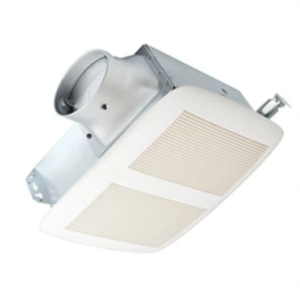 Whether you want humidity sensing, built in lights, or next to no sound, Broan has a fan for you. The QT Series fans are some of Broan’s quietest fans, ranging between 0.3-1.4 Sones. They’re available in a variety of sizes and can come with or without built in lights. Shop QT Series Fans here. The LoProfile fan is narrow enough that it can be installed in a wall between 2×4 studs. It’s designed to work with tight spaces and any plumbing or electrical obstructions that come up during remodels, without sacrificing any power or effectiveness. Shop LoProfile Ventilation Fans here. 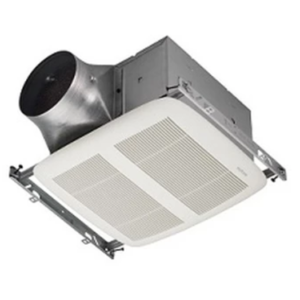 With a rating of <0.3 Sones and an Energy Star Most Efficient 2018 rating, the ULTRA GREEN series offers powerful fans that are energy efficient and almost impossible to hear. Shop ULTRA GREEN Multi Speed Fans here. Mold and mildew don’t stand a chance with Broan’s Humidity Sensing fans. You’ll have peace of mind knowing your bathroom is additionally protected from mold mildew, which can cause serious damage if left unchecked. The fans can also come with built in lights and motion sensing. Shop QT Series Humidity Sensing Fan here. Want more options? You can find Broan’s full selection of fans here!